Pushkin must be about 14 years old but still has no problem leaping the six foot wall at the bottom of the garden. 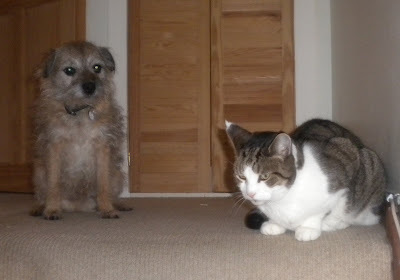 In the house, Harry knows that Pushkin is the boss, but outside in the garden it is a different story, and Harry will chase any cat away - including Pushkin. Harry seems like a well trained border, has he been neutered? Housemate, and yes at an early age. Ralph, my Norfolk/Jack Russell Cross (that's a guess) thinks he's the boss at home, at work, at play...I just let him think it. Oh...and Ralph's been neutered but is far from well behaved.